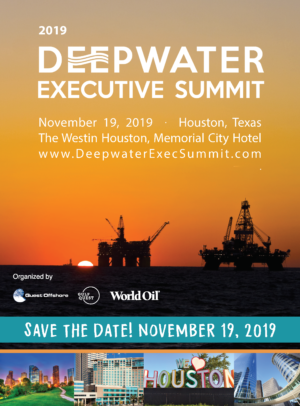 Deepwater Executive Summit (DES) is the only focused event dedicated to deepwater oil & gas and the strategic insights of global oil and gas operators in the sector. The Summit’s focused agenda provides a superior quality delegate experience. Following the highly successful inaugural event in 2018, we are pleased to announce the 2nd annual DES 2019 on November 19, 2019 at the The Westin Houston, Memorial City. Touted by delegates as exceptionally well organized and delivering enlightening panel discussions, each of our distinguished Operator speakers will offer prepared insightful remarks, as well as participate in a Panel Session. 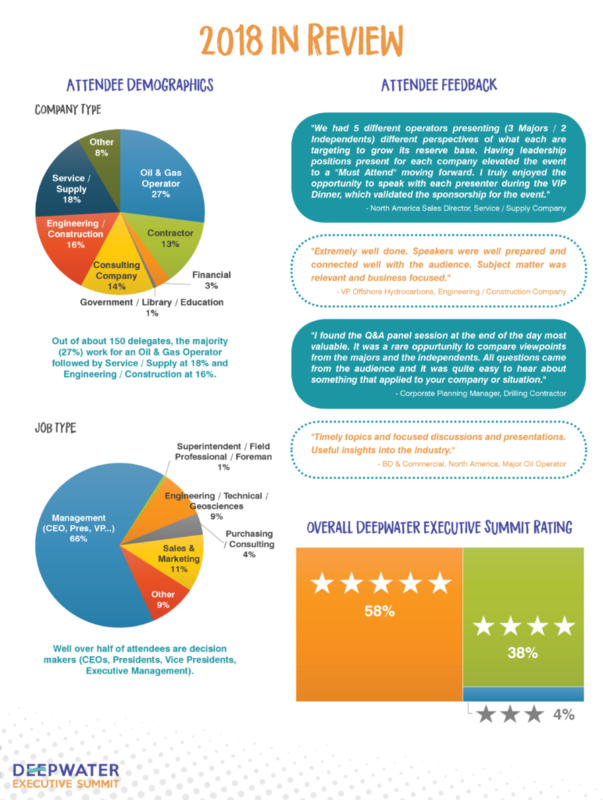 DES provides timely information to better understand the represented companies corporate strategies in deepwater, as well as insight into the Global Deepwater market. We are reaching a critical “Turning of the Tide” in the deepwater industry with Final Investment Decisions under greater scrutiny than ever before. A number of projects are starting to move forward, but the dynamics have changed and not all projects are a given. Both Operator and Service Company executives involved in the global deepwater industry will be joining us for this unique event, it should represent an ideal opportunity for you to network with your peer group, learn about what others have to say about the evolving deepwater industry, and share your valuable and unique insights.